Want something your pet will love well this is it! 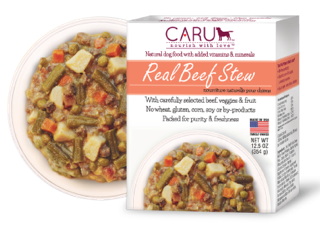 ﻿Beef, Beef Broth, Green Beans, Potatoes, Carrots, Peas, Apples, Sweet Potatoes, Tapioca Starch, Carrageenan, Tricalcium Phosphate, Sunflower Oil, Salt, Vitamins (Choline Bitartrate, Vitamin E Supplement, Vitamin A Supplement, Niacin, Calcium Pantothenate, Thiamine Mononitrate, Riboflavin, Pyridoxine Hydrochloride, Vitamin B12 Supplement, Folic Acid), Minerals (Zinc Sulfate, Ferrous Sulfate, Copper Sulfate, Manganese Sulfate, Potassium Iodide, Sodium Selenite). Crude Protein (min)4.0%Crude Fat (min)2.0%Crude Fiber (max)2.0%Moisture (max)84.0%Omega 6 Fatty Acids* (min)0.20%Omega 3 Fatty Acids* (min)0.02%* Not recognized as an essential nutrient by the AAFCO Dog Food Nutrient Profiles. ﻿Pork, Pork Broth, Green Beans, Carrots, Peas, Potatoes, Apples, Sweet Potatoes, Tapioca Starch, Tricalcium Phosphate, Salt, Vitamins (Choline Bitartrate, Vitamin E Supplement, Vitamin A Supplement, Niacin, Calcium Pantothenate, Thiamine Mononitrate, Riboflavin, Pyridoxine Hydrochloride, Vitamin B12 Supplement, Folic Acid), Minerals (Zinc Sulfate, Ferrous Sulfate, Copper Sulfate, Manganese Sulfate, Potassium Iodide, Sodium Selenite). Crude Protein (min)4.5%Crude Fat (min)2.0%Crude Fiber (max)2.0%Moisture (max)84.0%Omega 6 Fatty Acids* (min)0.30%Omega 3 Fatty Acids* (min)0.04%* Not recognized as an essential nutrient by the AAFCO Dog Food Nutrient Profiles. ﻿Beef, Potato Flour, Beet Molasses, Blueberries, Cranberries, Vegetable Glycerin, Dried Cultured Skim Milk, Mixed Tocopherols (a preservative). 3358 kcal/kg, 50 kcal per treat. The part where she was eating was speed up for the sake of the video! Can you use Caru for Agility? I was able to use these treats for agility with Roxy I love them because, you can tear them into smaller bite size pieces which is great if you have a smaller dog so you can choose the size of the treat! it has a huge meat scent to it which I love because it really gets Roxy's attention!!! I had about 4 Bags of these treats in the last 1-2 months and they are all gone!!! that is how quick i went through them!! !